« Take Me Out OF the Ballgame: Is the Bronx Becoming LA East? Bernie Williams entered June 1995 in a terrible slump, which prompted a temporary demotion to the bottom of the lineup. In order to motivate his young centerfielder, Buck Showalter jokingly suggested to Williams that after ninth, the next stop was the bench. The message must have been received loud and clear because not only did Bernie hit .419 in the eight games spent batting last, but he went on to have a borderline Hall of Fame career. Girardi has had Posada’s back all season, but could his patience be wearing out? Although Showalter’s not so subtle suggestion was meant to be in good fun (at least according to Michael Kay, who has recounted the story several times over the years), it also had a purpose. As Paul O’Neill articulated during a recent broadcast, players are well aware of how their position in the batting order reflects the manager’s current thinking. 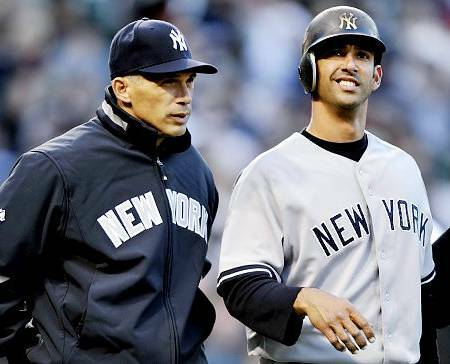 Well, if Jorge Posada was wondering about Joe Girardi’s state of mind, tonight’s lineup should cast aside any doubt. For the first time since May 14, 1999, exactly 12 years to the date, Jorge Posada is in the starting lineup batting ninth. The demotion, which marks the culmination of Posada’s gradual decent in the batting order, might be a bit startling because of his stature, but certainly not surprising considering his performance to date. Just last week, Posada publically thanked Girardi for his continued support, and before today’s game, he absolved him of any guilt by graciously accepting the decision. How could he not? A .165 batting average is impossible for even the most prideful player to ignore. It remains to be seen whether this ultimate demotion will motivate Posada. Unlike Williams in 1995, Posada is a 40-year old former catcher, not a young centerfielder in his prime. What’s more, Posada is also being forced to transition to a full-time DH. More than a few everyday players have complained about how difficult it is to adjust to such a limited a role, so just imagine the transition for a catcher who is used to being involved in every play. By moving Posada down to ninth, the Yankees have run out of options. If no longer being a catcher is really at the root of the problem, the team could consider making Posada the backup. However, for a variety of reasons, including concerns about a potential concussion, the Yankees seem dead set against that option. So, Posada will either have to adjust to the role of full-time DH or risk having it reduced to a part-time basis. Throughout Posada’s struggles, Girardi has continued to express support for his one time understudy, but even the fiercest loyalty has its limits. Tonight, it has been stretched all the way to the ninth slot. What comes next? You can bet that no one in the organization wants to find out.